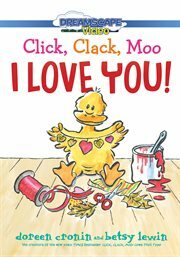 The item Click, clack, moo I love you!, (electronic resource) represents a specific, individual, material embodiment of a distinct intellectual or artistic creation found in Arapahoe Library District. It's Valentine's Day, and on the farm that means a Valentine's party. Little Duck is wildly excited. She hangs balloons, streamers, sparkling lights, and hearts everywhere, and she hand-makes a valentine for everyone. On top of a hill, a little fox hears the music from the party and follows Little Duck's many decorations to the barn...but foxes are not at all welcome on farms. The chickens stop dancing. The sheep stop dancing. The pigs stop dancing. The mice hustle off to hide. Will Little Fox ruin the dance? Perhaps she's just what the party needs!